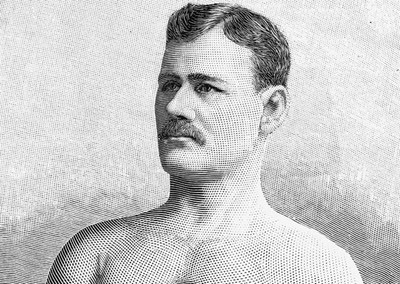 … “The Strangler” had beaten everyone—Joe Acton, William Muldoon, Tom Canon, everyone—and not only did he beat his contemporaries, he frightened them, using a full inventory of styles: London Prize (bareknuckle fighting), Catch-as-Catch-Can, Greco-Roman, “mixed” (meaning to say the rules were negotiated) and “go as you please” (meaning to say the rules were unwritten). Lewis’ game would be familiar to today’s mixed martial arts fans; though he specialized in the ground attack, he didn’t mind exchanging blows. In an era when matches were not stopped short of injury, Lewis would commonly emerge victorious via broken bone, torn joint, or crushed windpipe.